Samsung shipped about 50 million smartphones last quarter — about double the number Apple sold and, according to IDC, the largest number of units ever shipped by a handset vendor in a single quarter. However, if Raymond James data is any indicator, Samsung’s 2:1 lead over Apple is a statistic in vain. Apple — thanks to the higher gross margins of the iPhone and iPad — far outshines its rivals in both revenue and operating profits. Having generated only about 6 percent of the industry’s smartphones and tablets in the second quarter, Apple captured about 43 percent of the industry’s revenue and an astonishing 77 percent of the industry’s operating profits. Thats about 2.65 times that of Samsung’s. Interestingly enough, Apple and Samsung account for 96% of the global Mobile computings EBITs. Now you know why the rest of them are such a deep shade of Red! Apple’s statistic is of note especially in the light of the fact that Q2 in generally Apple’s weakest quarter and Samsung had the Galaxy SIII launch in Q2. Ultimately, profits are the feedstock of innovation; and, innovation drives profit. Until Samsung starts generating more profits than Apple, we would not be overly concerned with who has the unit share lead. Remember, HP and Dell still sell a lot more PCs than Apple sells Macs, but does it matter. Probably not to Apple. The era of mobile computing, catalyzed by Apple and Google, is driving among the largest shifts in consumer behavior over the last forty years. Impressively, its rate of adoption is outpacing both the PC revolution of the 1980s and the Internet Boom of the 1990s. Since 2007, more than 500 million iOS and Android smartphones and tablets have been activated. By the end of 2012, Flurry estimates that the cumulative number of iOS and Android devices activated will surge past 1 billion. According to IDC, over 800 million PCs were sold between 1981 and 2000, making the rate of iOS and Android smart device adoption more than four times faster than that of personal computers. While the Internet began its commercial ramp in 1996, iOS and Android devices have seen double the number of device activations during its first five years compared to the number of Internet users reached during its first five years (Internet 1996 – 2001 vs. Smart devices 2007 – 2012). On top of this massively growing iOS and Android device installed base, roughly 40 billion applications have already been downloaded from the App Store and Android Market. The average smartphone user, is beginning to spend more time in mobile applications than they do browsing the web. This chart by Flurry compares how daily interactive consumption has changed over the last 18 months between the web (both desktop and mobile web) and mobile native apps. 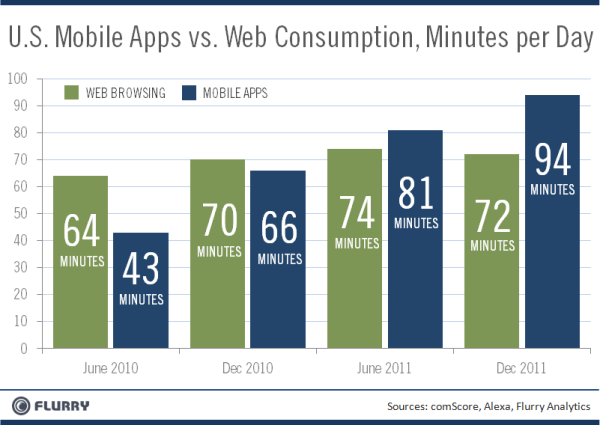 Ever since June 2011, time spent in mobile applications has grown. Smartphone and tablet users now spend over an hour and half of their day using applications. Meanwhile, average time spent on the web has shrunk, from 74 minutes to 72 minutes. Users seem to be substituting websites for applications, which may be more convenient to access throughout the day. People are now spending less time on the traditional web than they did during an year ago. This drop appears to be driven largely by a decrease in time spent on Facebook from the traditional web. In June 2011, the average Facebook user spent over 33 minutes on average per day on the website. Now, that number is below 24 minutes. Time spent on the web without Facebook has grown at a modest rate of 2% between June 2011 and December 2011. Even while, the growth in time spent in mobile applications is slowing – from above 23% between December 2010 and June 2011 this year to a little over 15% from June 2011 to December 2011. The growth is predominately being driven by an increase in the number of sessions, as opposed to longer session lengths. Consumers are using their apps more frequently. Facebook is the most used app on Android among 14 – 44 year olds, surpassing usage of Google’s own native, pre-installed apps. Additionally, Facebook Messenger became the top downloaded app, at least one time during 2011, across more than 100 different App Store countries. In the U.S., the largest App Store market, Facebook Messenger ranked as the top overall app across all other apps across all categories. This is the final part of the five part series profiling Microsoft Windows Mobile 7.0. In the earlier posts, i had discussed hardware, software perspectives, developer perspective & platform shortcomings and Microsoft’s service strategy around WinMo 7.0. For long Microsoft has been sidelined in the smartphone computing space by the Androids and Apples of the world. Windows Mobile 6.5 never gave any hope and as a user and a technoholic, I hope that Microsoft gets its game right with WinMo 7.0. This is not only important for Microsoft but also from an eco-system perspective. 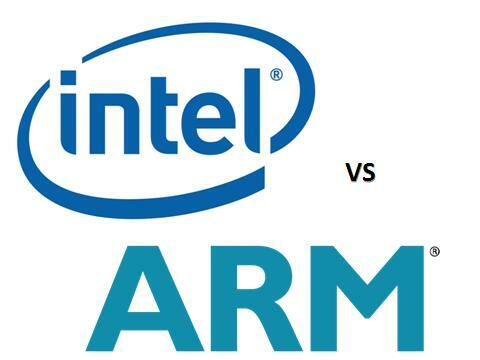 The Android juggernaut needs to have some competition from Microsoft to maintain the balance in the industry. Apple is competitive but then it is very elitist and specific. Android seems to be taking the mid end devices fully. Competition from Microsoft space in the mid end could liven up things a bit, which otherwise is becoming Android monopoly. Looking slightly longer term, we think this is an area Microsoft will need to pay special attention to if it wants to join in the looming battle for the Living Room, with mobile devices as a key part of that. Although it has Zune and Windows Media Player, Microsoft has nothing with the market presence and direct link to the consumers’ wallet that iTunes has. It is also not seen as a visionary player in understanding people’s overall media usage. The WinMo 7.0 release saw a refreshingly humble Microsoft tone for the smartphone world. It spoke of “elegant co-existence” with partners, which will have pleased network operators. Its approach was in stark contrast to the way some manufacturers have approached working with distribution channels. Windows Phone 7 and the way it was brought to market has a good chance oflifting Microsoft’s position in the mobile arena. Microsoft desperately needs this to work well, so that the company becomes relevant again in mobile. The agenda in smartphones is currently being set by Apple and Google, and some observers believe that the battle is really about the future of computing, with the mobile domain as one vital part. Microsoft needs a strong position in mobile to play a part in that debate. To succeed Microsoft will need to see the launch as no more than a key first step and sustain the effort across all fronts. However, even if it does so, we see sales constrained by the high-end hardware specifications and the fact that it is launching into a crowded market. Mobile is central to the Microsoft’s transformation into a services business. If Microsoft fails in mobile the shift of the wider business beyond a reliance on software licence revenue will certainly falter. 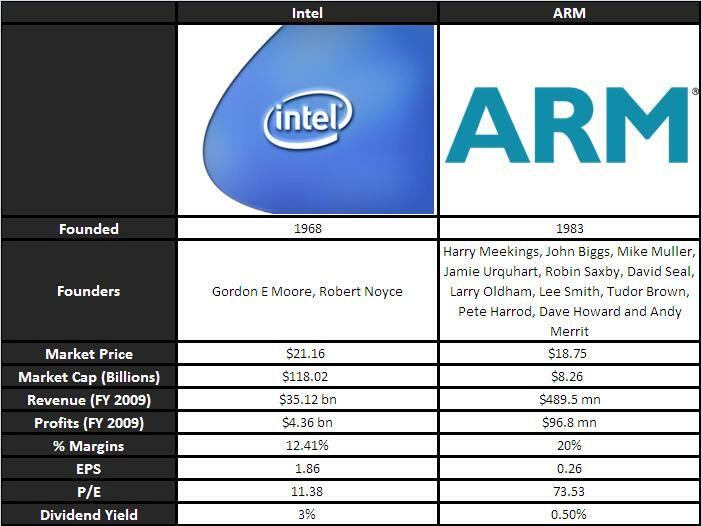 More importantly, Apple and Google have proved that the market is still in its infancy, with newcomers still able to cause mass disruption with the right recipe of hardware, software and services. Should Window Phone 7 fail Microsoft arguably has little option but to go back to the drawing board or risk being further marginalised. However, failure at a time when others are becoming increasingly dominant would raise serious doubts about Microsoft’s ability to compete side-by-side in Web services. 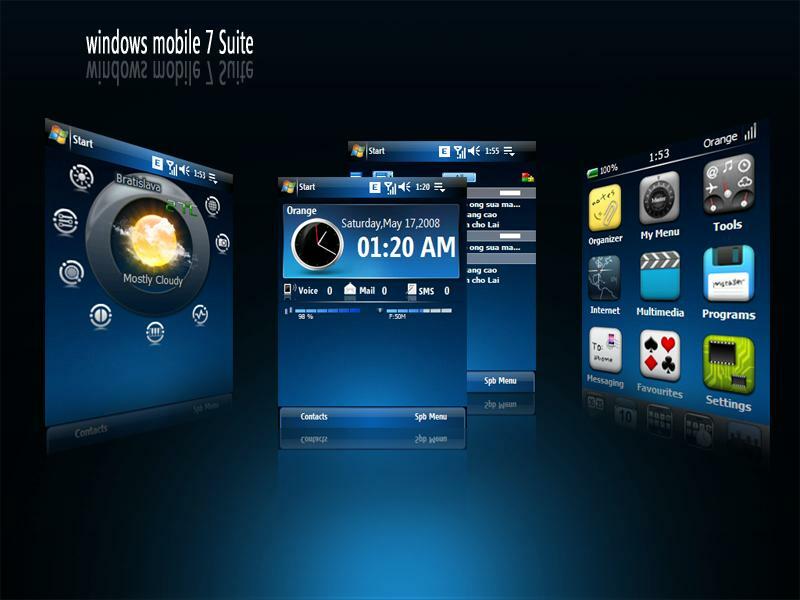 This is the fourth of five part series profiling Microsoft Windows Mobile 7.0. In the earlier posts, i had discussed hardware, software perspectives, developer perspective and platform shortcomings around the WinMo7. This post discusses the importance of Windows Mobile 7.0 for effective launch of the Microsoft Online services. WInMo 7.0 is not just a revenue machine for Microsoft, it also is enabler for other online services for Microsoft. WinMo 7.0’s integration with Microsoft web-services will determine the successs of Microsoft efforts to bridge the distance between its current state and its future in Mobile/Smartphone computing. Mobile is central to the Microsoft’s transformation into a services business. And WinMo 7.0 is key to Microsoft’s Mobile phone aspirations. Services is central to the Windows Phone 7 strategy, given the need to provide a rounded offering and the opportunity to substantially extend the reach of such services. Windows Phone and Microsoft services are now intrinsically linked. The success of the platform relies on consumer appetite for Microsoft services, and those services are reliant on Microsoft extending its reach beyond the PC. 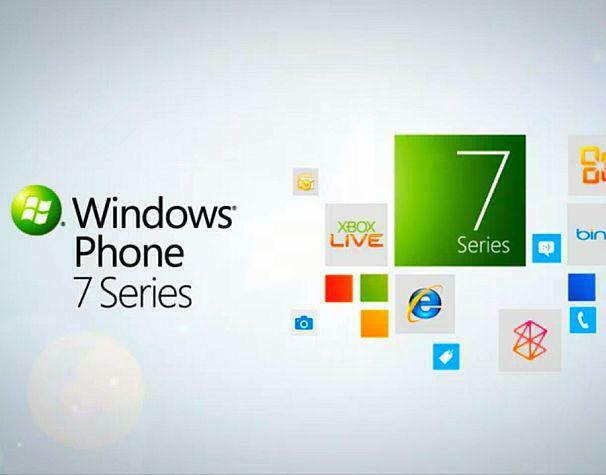 Windows Phone 7 will be expected to help boost the profitability of the online services division. The success of the platform relies on consumer appetite for Microsoft services, and those services are reliant on Microsoft extending its reach beyond the PC. Windows Phone 7 will be expected to help boost the profitability of the online services division. While the list reads long, it has some very important “misses” which translate into shortcomings. This includes lack of Netflix or a movie download stream and lack of e-book store, Twitter, Skype and Flickr. Microsoft also has some work to do with promoting the Zune which is not recognized as much outside of US. Fortunately for Microsoft, the strongest service element in Windows Phone 7 is also the one that is of most strategic importance. Bing search is tightly integrated into the platform and closely tailored to the specifics of mobile search. Results are filtered according to locality (derived from Wi-Fi, cell proximity or GPS) and enable direct calling or messaging. Bing is typical of the service continuity and value that Microsoft is seeking to deliver across multiple platforms. Moreover, the broader business will hope that the richer, contextual experience on Windows Phone 7 will help drive wider usage. The challenge facing Microsoft is Google’s head start and plans to fully integrate search across a wide range of devices. Competing with Google’s growing coverage of consumer electronics must be a daunting prospect for Microsoft and, unlike Android and Chrome OS, Windows Phone 7 will remain limited to high-tier mobile phones. This is the third of five part series profiling Microsoft Windows Mobile 7.0. In the earlier posts, i had discussed hardware and software perspectives around the WinMo7. This post discusses the shortcomings in the platform and how Microsoft is wooing the developer community to earn back relevance in the apps space. Two main problems remain with the Windows Phone 7 operating system at this stage. Firstly, there is no opportunity for manufacturers or operators to add their own interface layer (although Hubs and tiles do allow for a degree of customization). Microsoft argues that it is putting consumers first and has heavily invested in a strong and consistent interface. The implication is that there is little benefit in manufacturers undertaking further customization that will only confuse users. Secondly, there is no multitasking. Windows Phone 7 does support some background processes, such as playing music or synchronising e-mail while using another application. However, it does not currently support flipping between live applications in the way that Symbian and Maemo users have had for a long time and Apple users have recently acquired with iOS4. Microsoft may possibly. This would be a thorn at the start and one would expect Microsoft to address the Multitasking measure in future. Microsoft is using established strengths and resources to attract developers. It has relied on existing Silverlight and XNA development frameworks, and removed licence fees for many tools, including Visual Studio 2010 Express and XNA Game Studio 4.0. The consistent environment and tools provided by XNA Game Studio 4.0 will enable developers to port games from Windows, Xbox 360 or Zune to Windows Phone 7. Variations in hardware and screen sizes will be limiting factors, but demonstrations of ported titles reveal a rich and consistent experience. The use of common code and tools is a step forward for Microsoft, which has historically had an abundance of tools and developers but a lack of commonality across platforms. Unsurprisingly, Microsoft cites this established developer base with deep existing knowledge of its tools as a significant opportunity. This will be important, because application developers typically develop for three or four platforms. The current pecking order for many of them is Apple, Android, Blackberry, other. The last category includes, of course, Symbian, MeeGo, Flash, Java (for Qualcomm’s BREW, Sony Ericsson’s Cappucin and Nokia’s Series 40 feature phones) and Microsoft. If Microsoft decides it needs to address these developers, the task will be to pull itself out of the “other” category. Windows Phone 7 is a drastic step for Microsoft, in that it completely discarded the Windows Mobile platform and allowed designers to start largely from a blank sheet of paper. The exception to this was the work done in developing the Zune user interface, which has been carried across to Windows Phone 7. The “clean sheet” approach may have resulted in a lengthy development cycle as Apple and Google grew exponentially, but we believe the outcome vindicates the decision to build an entirely new platform, designed from the ground up for Microsoft services. Indeed, Windows Phone 7 puts further pressure on Nokia to ensure the swift delivery of MeeGo and Symbian^4, not only to alleviate further drops in market share, but to bolster a weakening position in developer support. Unusually for Microsoft, the design has been led almost completely from a consumer’s point of view, even though the company has ambitions for Windows Phone 7 in the enterprise market. The emphasis throughout has been on quality of execution rather than stuffing it full of features. The interface is very smooth, slick and fast on all the devices CCS Insight has used. It has also been designed with fresh thinking and it contains a number of neat innovations. For example, the camera interface shows a glimpse of the previously taken photo at one side of the screen, making it obvious how to get back to an earlier picture. The architecture of Windows Phone 7 is also innovative. It is based on “Hubs” — areas of the software that manage access to different types of content. Microsoft provides six Windows Phone Hubs: People, Pictures, Games, Music and Videos, Office and Marketplace. In addition to these it is also possible for handset manufacturers and carrier partners to create Hubs as a way of presenting their own content and services. Beyond this, Microsoft’s partners can create tiles for the home page, so that users have a shortcut (containing live content) to the Hubs. Hubs effectively blur the line between applications and services, enabling closer integration of services with aspects of the phone. Examples are already seen in the way that the People Hub integrates with Facebook and in the way some of the music service applications connect to the Music Hub. point of differentiation as it seeks to win developer support. Although Windows Phone 7 has a consumer-friendly design, Microsoft has built in significant capabilities for Office, including the ability to view, edit and annotate Office 2010 documents, integration with Outlook and collaboration with OneNote and SharePoint. As a result the platform has respectable enterprise credentials. However, the high cost of handsets will be a significant inhibitor to widespread adoption among businesses in the short term and the platform lacks the comprehensive device management and security policy features that characterized Windows Mobile 6.5. It is expected that WinMo 7’s enterprise capability will evolve much the same way as iPhone and Android did in the Enterprise segment. The bigger play for Microsoft is positioning Windows Phone 7 as “a great gaming platform”. Microsoft has linked Windows Phone 7 into its Xbox Live service. This could establish Windows Phone 7 as the leading mobile platform for high-end games. Although the size of this opportunity is arguably smaller in volume terms than the more casual gaming segment, it could prove a highly lucrative opportunity for game developers. This would represent healthy competition for the iPhone, which has come to dominate gaming on high-end devices, particularly given Android’s limited standing as a games environment at present. However, Sony’s PlayStation Portable gaming platform is expected to migrate from dedicated hardware to Sony Ericsson Android devices in the near term. Such a move would not only increase competition but represent a solution for a far broader range of mass-market devices. The launch of Windows Phone 7 is a critically important event for Microsoft. Analysts have defined it as a “make or break” moment in the company’s history. This is in part because of the scale of opportunity as smartphones enter the mass market, but more significantly because the battle between Apple and Google is largely being fought in the mobile domain, where Microsoft has yet to play a real part. Given that the mobile phone is now the most prolific computing platform on the planet, it is essential that Microsoft grabs a significant share. Success in all aspects of the mobile market (devices, software and services) will be critical to Microsoft’s future if it is to successfully diversify from a software licence business to one specializing in hardware and services. Expectations for Windows Phone 7 are uncharacteristically low for a Microsoft product. The platform is launching relatively late into a crowded market, follows the ill-fated launch of Microsoft’s Kin phone and software earlier in the year and Microsoft’s previous efforts in mobile were wholly out of step with market requirements. Hardware specifications are far more tightly defined than previous versions of Microsoft’s mobile operating system. This rigid control of hardware design sees Microsoft moving closer to the vertically integrated model adopted by Apple and RIM, albeit using a range of manufacturing partners. Microsoft is restricting flexibility in how the platform can be deployed and customized in order to closely control the end-user experience and the “look and feel” of its own services. This is something that Google has not been able to master even as Android looks different in multiple versions of its OS. Microsoft’s tight leash on hardware design is a result of a careful examination of the factors behind Apple’s success as well as a deep understanding of the challenges in maintaining consistency of experience and time to market with a horizontal platform. While Microsoft’s vertically integrated model for Hardware design may be great for the ubiquitous-ness of the WinMo experience at users level, the similarity of the devices means few operators will require more than one or two models. This means ten phones are competing for a small number of portfolio slots. That said, an unexpected opportunity has emerged in the second half of 2010 as high profile products suffer delays, in some cases caused by constrained supply of key components such as screens. This means that operators and distributors are seeking high-tier devices that can be delivered in reliable quantities. Also important to consider is the fact that many operators are looking for a counter to Apple’s dominance at the high end. Whilst customization opportunities are limited with Windows Phone 7, it affords far greater scope for operator services than the iPhone.